Casa Verde is a unique Mexican hacienda style home, located in a small gated community on the sandy shores of the Sea of Cortez. This beautiful home has all the modern conveniences, a fully equipped kitchen, all linens, towels and beach towels. It has spectacular 16 foot palapa (palm leaf) ceilings, locally quarried stone walls, a courtyard with a fountain, lushly landscaped grounds, and mature palm trees. Casa Verde has been described as 'Mexican Sophistication'. You will enjoy miles of uncrowded beach, swimming, world class fishing, golf, snorkeling, kayaking, diving, hiking, ATV riding, shopping, great local restaurants and hours of wonderful relaxation. You will love it. Casa Verde is about one hour north of the Los Cabos International Airport, and ten miles south of the town of Los Barriles. Casa Verde Bed & Bath Rooms: The spacious master suite bedroom has a king-size bed with locally hand-made headboard and table lamps, a 16-foot palapa ceiling, a breath taking sea view, sliding glass doors to the beach porch and a custom cedar walk-through closet. The over-sized master suite bathroom has a large Mexican-tiled shower, a Mexican-tiled vanity with a beautiful talavera sink. A door in the bathroom opens directly into the same enclosed secret garden... a private hideaway. In the Main House, in the true Hacienda style, both guest rooms have their own keyed entry that open to the fountain courtyard. Both rooms, and the over-sized bathroom, have 16 foot palapa ceilings, Mexican decorations, and unique window coverings. 3 bedrooms have a king-size beds, the other guest bedroom has two twin beds. When you rent Casa Verde for 2 to 6 people (bedrooms 1 to 3), the rate is $390.00. If you need room for 1 or 2 additional people, you can rent bedroom #4 at a discounted rate of just $100.00/night. That brings the total rate to $490.00. Fun Activities at Casa Verde: Life is good living on the beach. Experience fabulous fishing, snorkeling, kayaking, swimming, sunbathing, and peaceful walks. The East Cape is famous for its world-class fishing. Experience the heart pounding thrill of landing a big marlin. The relaxation of walk on the beach. In no time at all at Casa Verde, you will experience the 'Baja Feeling' and the wonderful memories of you trip will last a lifetime. It is very easy to explain why we bought and them built our vacation home on the East Cape of Baja. 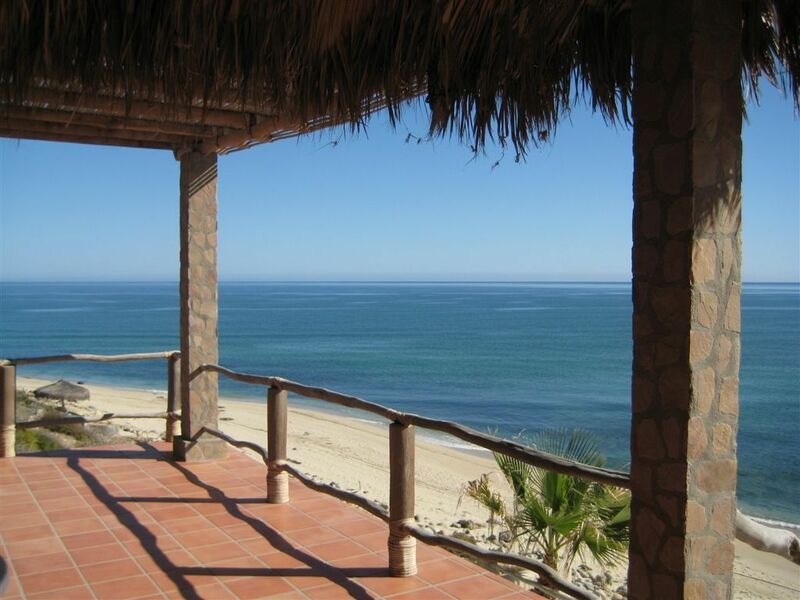 The property is on the beautiful shores of the magnificent Sea of Cortez. It is sunny more than 300 days of the year. The fishing is some of the best in the world. It is away for the crowds, some what like Cabo was 30 years ago. And the local people are warn, friendly and the true spirit of Baja. It's also a great place to wiggle your toes in the sand. The choice was easy, it makes us feel good. We hope it does the same for you. Extra large Mexican tiled showers. Beautiful Talavera sinks with matching appointments. Comfortable large rooms. Casa Verde is on the beach that has excellent swimming, snorkeling Kayaking. We supply 2 kayaks, the snorkels and fins and flotation devices. Casa Verde is on the beach of the Sea of Cortez. Step out the door and you have miles of uncrowded beach to enjoy. It's great for swimming, snorkeling, fishing, kayaking, walking, shelling, relaxing, working on your tan, and the favorite pastime, wiggling your toes in the sand. Step off the porch and be on the beach. Enjoy the swimming, the great snorlkeling, kayaking, fishing, miles of uncrowded beach, shelling or sun bathing and working on your tan. Looking west are the magnificent Sierra Laguna mountains rising over 4000 feet. The view of the sunsets are breath taking. Casa Verde is on the shores of the beautiful Sea of Cortez. Walk down off the porch and play on the sandy beach, swim, snorkel or kayak in the warm water. You need to bring your own computer. Over 30 videos to choose from. The Guest House has 2 porches. A spectacular view of the water and the other an expansive view of the desert and the massive Laguna Mts. We have 2 kayaks for our quests. One is single and the other one is a double kayak. Local charter boats are available for fishing, sightseeing, diving and snorkeling. Large beach side shade covered porch, 45' by 15' and a 2nd sun porch that access the beach. The deck can be accessed though 3 sliding glass doors in the Master Bedroom, Living Room & Dining Room. 2 Kayaks (i singel,1 double) for supplies for to guest use. Snorkels, fins and flotation devices are also available our guests to use. The are 10 world class golf courses in the near by cities of San Jose, Cabo San Lucas and La Paz. Some of the most beautiful courses you will ever play. Thank you Fred and Marsha for a wonderful stay over New Years! This property is a lovely beach front home that is very well kept. It sits a bit above the beach so you have to walk down some steps to get to the sand but the views are spectacular. Kayaks are there for your use as well as snorkel gear. We had some wind when we were there so can`t comment on the snorkeling. The place would be great for a larger group and Fred was an outstanding host helping us with getting a cook to come in as well as great directions. If you want a getaway that is quiet and away from it all this is the place. I highly recommend we would stay again. Wow! Is all we can say about Casa Verde and Rancho Leonaro. The Green Family have been very attentive to the details and furnishing of their home. All the rooms were so comfortable and clean. The beds were super comfy, lots of linens and towels. Everything you need to feel at home in Mexico! I would highly recommend this to anyone planning to rent a home. You won't want to leave! Thanks again to the Green Family. We just returned from 2 wonderful weeks at Casa Verde. We rented the entire property and brought all our kids and a grandson with us. There were 8 of us altogether and we were all very comfortable. There is plenty of room so that you are not on top of one another and even have room to roam the property. Fred & Marsha have done a great job at decorating this place in the Mexican tradition and it shows just like the pictures, in fact the pictures just don't do this house justice. The guest house was perfect for one family with a teenager. The internet worked so we could stay connected to our businesses and employees and the phone was perfect too. We kayaked, snorkeled, fished, played in the water, walked on the beach and sat on the porch for hours on end. The evenings were full of star gazing and satellite viewings as well as lightening shows in the distance. Since we were there during the "wet" season we did get a little bit of rain and it was wonderful. The guys fished with Jen Wren and everyone caught and released billfish since it was the season. The kitchen was stocked; the water is good so no need for bottled water. We had a caterer come in 4 nights and cook dinner; she even does the clean-up! It was such a treat to have authentic Mexican food from a local. The store by the airport is perfect before heading to the house, but there are also some smaller stores in town that carried all we needed. The caretakers are wonderful and very accommodating. Fred and Marsha were available at all times by phone. I would recommend this property for anyone, except with very young children; there are many steps down to the beach. People with disabilities could get to the beach from the road, but not down the stairs. We will be back again to this wonderful location and hopefully soon. Thank you Marsha & Fred, your house deserves the 5 out of 5 stars. This vacation was one that we and our children and grandchild will never forget! This is a wonderful property. My family and I stayed here during Spring Break 2015, and loved every minute of it. The drive in from the highway takes about 12-15 minutes, and is along a fairly well-maintained dirt road. We did not find that a four wheel or high clearance vehicle was necessary. The home is beautiful, spacious, has every amenity you would expect, and opens to a striking view of the water. The guest house is spacious and comfortable, and two additional bedrooms in the main house have separate entry, which is great for teenage kids or separate families. We used the outdoor grill to cook fresh dorado all week. The kitchen is well done and is stocked with cleaning supplies, towels, blender, cutlery, etc. We found everything we needed to prepare most of the meals we had during the week. The back patio is just high enough over the water to see everything (we saw whales, sea lions, fish) but close enough to feel like it is part of the property. We fished with and rented ATV's from the people recommended by the owners and could not have asked for better service. The master bed is very comfortable, and waking each morning to the sound of the surf could not have been better. We spent hours exploring the beach in both directions, and felt as though we had it to ourselves most of the time. The people in Los Barriles are kind, friendly, service-oriented, and appeared to welcome guests from the U.S. The owners were very easy to deal with, provided a lot of information, and responded to all of our pre-trip inquiries. We were very happy with our experience in this beautiful, and well-maintained home. This property is simply stunning! If you want an out of the way place where you feel like you have the beach to yourself, this is the place! Take advantage of the peace and tranquility. Most days, we never saw another person. We fished from the shore and did well. There are basically 3 separate living spaces, with the main house being large enough for gathering. It was only about 10-15 minutes into Los Barriles. There were many great places to eat in town, but the town closes down earlier than Cabo. We aren't night owls so it was great for us. We went on a spectacular hike in the canyons above Santiago (a 30 min drive south) with Edguardo from Baja Sierra Adventures. AMAZING! Also drove up to La Paz for a Whale shark and sea lion tour. The drive was under 2 hours. The mountain road twists and turns but we didn't have any problems. It was a pretty drive. The home is comfortable and well equipped. The view from the deck is incredible! The house is right on the beach. If you want to party, stay in Cabo. If you want to get away from it all, stay here! Casa Verde is 42 miles north of the Los Cabos International Airport, equidistant between Cabo San Lucas and La Paz. Casa Verde is on the shore of the Sea of Cortez, where the desert meets the sea. There is fun & adventure for the whole family. We have world famous deep sea and inshore fishing. Catch the marlin you have always dreamt about. A few hundred yards up the beach, you can charter a boat to go for sailfish, marlin, dorado, tuna, whoo, pargo and a variety of other great sport fish. There are miles of uncrowded sandy beaches to explore. Also, there is all the swimming , snorkeling, diving and kayaking you can handle. The kids love playing in the sand and building forts drift wood forts. Hike the near by hills and desert trails, rent ATVs & go four wheeling. On the shaded porch, relax with a book & your favorite beverage. Or, while being cooled by a gentle sea breeze, take a siesta. Do as much or as little as you wish. You will take home memories that will last a life time.